I pretty much like anything with an orange flavor, and these scones are no exception. This recipe combines the great flavor of orange with dried cranberries. These scones go great with a cup of tea or coffee, or just as a snack. Preheat oven to 425 degrees. Line 2 large baking sheets with parchment paper. Place sugar and zest in a food processor; pulse 2 or 3 times to combine. Add flour, baking powder and salt; pulse to combine. Scatter butter pieces over flour mixture and pulse until butter is incorporated with a few larger pieces remaining. Add cranberries and pulse once or twice, just to mix. Transfer flour mixture to a large bowl. Pour heavy cream on top and stir with a fork until just combined; do not overmix. Line an 8-inch round baking pan with plastic wrap. Press dough into pan to form an even layer. Turn out dough onto a lightly floured countertop, carefully peel off plastic wrap and cut dough into 12 even wedges with a sharp knife. Place scones on baking sheets. Bake until light golden, 12 to 15 minutes. Cool scones on a wire rack. Make glaze: Stir sugar and juice in a small bowl with a fork. Add more sugar to thicken or orange juice to thin if necessary. Drizzle glaze over scones and let stand 10 minutes to set. I love orange and cranberry combos! These scones look delicious! 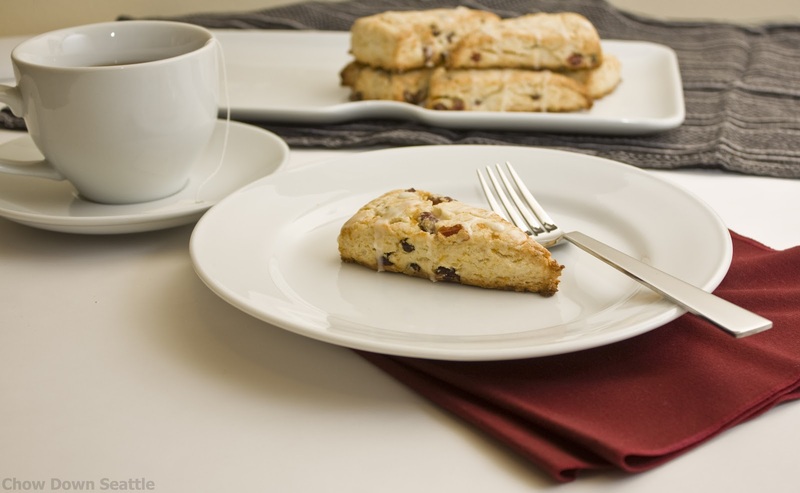 Cranberry orange scones are one of my favorites. They are great with a glass of tea in the afternoon. Beautiful photo!